Mix vinegar or baking soda with the detergent. Use a good fabric softener to soak your clothes. Store your clothes in a dry place. What is the only thing that we wait for after getting a hard beating (we don’t mean literal beating here) from the scorching heat during summers? Chilled ice-cream, cold drinks and cold showers? Of course, these may temporarily provide you the relief but that’s not something you have to wait for because all the aforementioned items can be easily purchased from the stores and you can take the showers at your home but what nobody can call for whenever they want is monsoon. Yes, that’s the only thing that can make a difference in our lives during summers. Those dark clouds, thundering sounds of lighting, cool breeze mark the arrival of monsoons and we could not be more happier and relieved. It is a happy season that brings cheers to lives, smiles to the face and love in the heart. But that’s not just it. There are some down side to it as well. If you are not sure what we are talking about, did you smell your clothes yet? Well, no matter how many times you wash your clothes or give them for laundry, they never smell fresh. That mold smell can really make them stinky. So, monsoon is also the time when you should start looking for tips for preventing mold and the mold smell. Your clothes smell musty or moldy because of the moisture in the air. 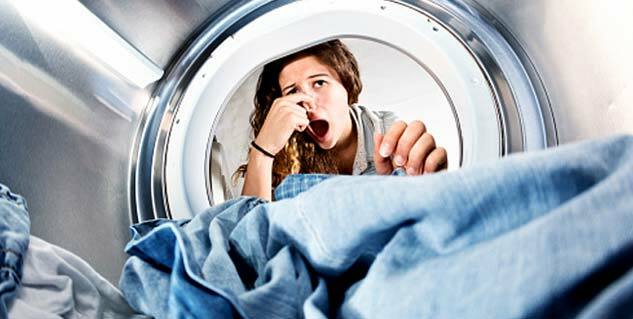 You can ensure whether your clothes qualify for laundry by sniffing to check if they stink. In case, your clothes don’t stink, just spread them under the fan for a while and you can wear them a couple of time more. If you have to wash your clothes just because of nasty stain, instead of tossing them for laundry use an old toothbrush to scrape the stain. To know more hacks that can help you. Most of us have a habit of throwing clothes right in the machine and washing only when there are tons of clothes that we can wash together. And it gets even worse during monsoons, as it makes your clothes stink more because odour worsens with time. So, instead of piling them in the machine, hang the garments somewhere separately. You can also remove mold from clothes or that moldy smell by adding vinegar or baking soda to the detergent to neutralize and eliminate the unpleasant smell from your clothes. So, next time when you put your clothes in the machine, don’t forget to add a cup of white vinegar or baking soda along with a good detergent. Once you are done with the laundry, soak the clothes in a fabric softener for about 10-15 minutes. Later rinse them with water and your clothes will smell fresh again. Instead of waiting for sun to come up so that you can dry clothes outside, line your clothes in your room near the window for good ventilation and leave the fan open for them to dry and not smell. This way you can remove mold from clothes. The best way to prevent your clothes from smelling so bad is to keep your clothes in a dry place in order to keep the dampness away from the clothes.